Drugs produced by the New England Compounding Center were not put through the minimum procedures required to ensure sterility and were shipped to customers before the pharmacy’s own safety tests were completed, a state health official said Tuesday in announcing preliminary ­results of an inspection of the pharmacy at the heart of the national meningitis outbreak. Investigators who visited the pharmacy in recent weeks found dirty lab equipment, a leaking boiler near the pharmacy’s “clean room,” and ­records that showed the pharmacy failed to properly maintain important sterilization tools, Madeleine Biondolillo, director of the state Bureau of Health Care Safety and Quality, said during a State House press conference Tuesday afternoon. Governor Deval Patrick said the state would immediately begin annual, unannounced inspections of the roughly 25 other compounding pharmacies in Massachusetts that prepare sterile injectable medications such as those directly linked to the outbreak. Officials also announced that the Massachusetts Board of Registration in Pharmacy is seeking the permanent surrender of New England Compounding’s pharmacy license, as well as permanent revocation of the licenses of the company’s three pharmacists, includ­ing Barry Cadden and Lisa Conigliaro Cadden, the husband-and-wife team at the center of the pharmacy operations. “Those whose laboratory practices caused this outbreak should never practice pharmacy or manufacture in Massachusetts again,” Patrick said. 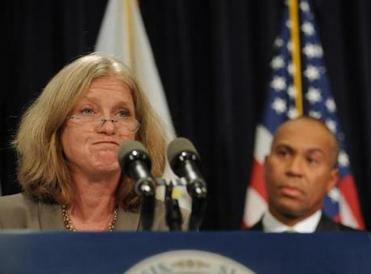 Bureau of Health Care Safety chief Madeleine Biondolillo spoke to reporters Tuesday. The list, which includes doctors, health centers, and most of the state’s hospitals, is a longer version of one provided Monday by the federal government. The governor said he wants to see strengthened penalties for compounding pharmacies that violate state rules and to require them to file regular ­reports about the type and quantity of drugs produced. It is “clear that our own rules here in Massachusetts governing compounding pharmacies have not kept pace with an industry that’s changing rapidly,” he said. As the governor spoke, state inspectors were already onsite in the first surprise inspection, Patrick administration spokesman Alec Loftus said later. ­Results of that inspection at an undisclosed location will be made public in the next few days, he said. The state’s lack until now of unannounced inspections was unusual compared with the rest of the country, said ­Carmen Catizone, executive ­director of the National Association of Boards of Pharmacy. Since the recession, how­ever, many states have scaled back oversight because of a lack of money, he said. But 10 states — including Texas, ­Arkansas, and Ohio — continue that practice. Those states are able to use fees collected from inspections to fund the oversight, while most others, including Massachusetts, place that money in the state’s general coffers, Catizone said. “There are some serious concerns with safety nets that should exist at the state levels because of a lack of resources,” he said. An injectable steroid produced at New England Compounding has been linked to more than 300 fungal meningitis and joint infections and 23 deaths. Tests have matched the fungus found in many of the patients with a type found in unopened vials of the steroid shipped from New England Compounding, but investigators have not yet determined how the fungus got into the ­vials. Biondolillo said the preliminary investigation shows that on 13 occasions company staff shipped orders from the suspected lots of contaminated steroids before receiving tests confirming those vials were sterile. Drugs were shipped as long as 11 days before results were received, she said. The tests later showed no contamination in those vials, but the adequacy of the company’s testing methods is being examined, the inspection ­report said. US Food and Drug Administration spokeswoman Erica Jefferson said Friday that the agency does not believe at this point that raw ingredients used by New England Compounding to mix the steroids were the source of the contamination, putting the focus on what happened inside the lab. Among the state’s findings of potential contamination sources were the leaking boiler next to the room where sterile medications were produced, a dirty mat staffers used to wipe their shoes before entering that sterile room, and a ventilation hood where powder residue was seen. Investigators also found the company was regularly shipping large quantities of drugs to customers without having a patient-specific prescription in hand, in violation of state law. “With this violation, NECC was operating beyond the scope of its compounding ­license, instead operating as a manufacturer,” Biondolillo said. New England Compounding released a statement Tuesday night from its lawyer, Paul Cirel, that said the Board of Registration in Pharmacy had numerous opportunities, includ­ing as recently as last summer, to make firsthand obser­vations of the company’s facilities and operations. “Based on that history, it is hard to imagine that the board has not been fully apprised of both the manner and scale of the company’s operations,” Cirel said. The company said Cirel would appeal the state’s move to permanently revoke the company’s license and those of its three pharmacists. An inspection by pharmacy board staff on May 24, 2011, did not uncover any sanitation problems. That inspection was done as a result of the company moving into a renovated and ­expanded space at the beginning of that month, so the pharmacy may have been in pristine condition as a result of the recent move. Industry specialists said that the state’s records from that May 2011 inspection suggest the review was cursory at best. “It doesn’t tell us anything about the company’s policies and procedures,” said Todd Brown, executive director of the Massachusetts Independent Pharmacists Association, a trade group that represents most compounders. The inspection report was included in hundreds of pages of documents released Monday about New England Compounding and its sister company, Ameridose, and their history with state regulators, includ­ing inspection reports, complaints, and correspondence between the pharmacy board and the companies. State officials have said their investigation includes the operations of Ameridose, a pharmaceutical company that has the same owners as New England Compounding. The preliminary report on the current investigation notes that federal and state inspectors collected samples of sealed ­vials of “completed product’’ at Ameridose on Oct. 18. Results are pending with the FDA. Problems similar to the ones found this month at New England Compounding were noted in a consultant’s report of a January 2006 inspection: “residual chemical build up on the inside of powder hoods,’’ equipment exteriors that were visibly dirty, sterilization equipment that was not verified, and portions of the floors that had not been sterilized in three months. The consulting company said those issues were largely resolved during a return visit several months later. In a related development, the FDA posted on its website late Tuesday a corrected list of more than 3,000 New England Compounding customers who purchased products other than the suspected lots of steroids. Among them were 215 Massachusetts doctors and health centers, including most of the state’s hospitals. The FDA had posted a shorter customer list Monday, then removed it hours later. A spokeswoman said the agency wrongly sorted a spreadsheet provided by the company. Todd Wallack contributed to this report. Kay Lazar can be reached at klazar@globe.com. Liz Kowalczyk can be reached at kowalczyk@globe.com.